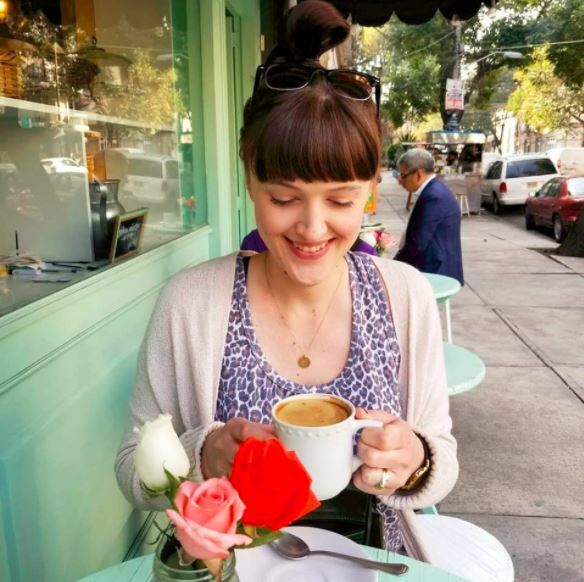 My team at work has a breakfast club every Monday morning and given I’m not very breakfast-y, it’s been a challenge to come up with some yummy and “el train” survivable goodies (if you have any suggestions, please send them my way!) I brought this quiche last time which was a hit but thought it would be fun to try some new recipes this time around. 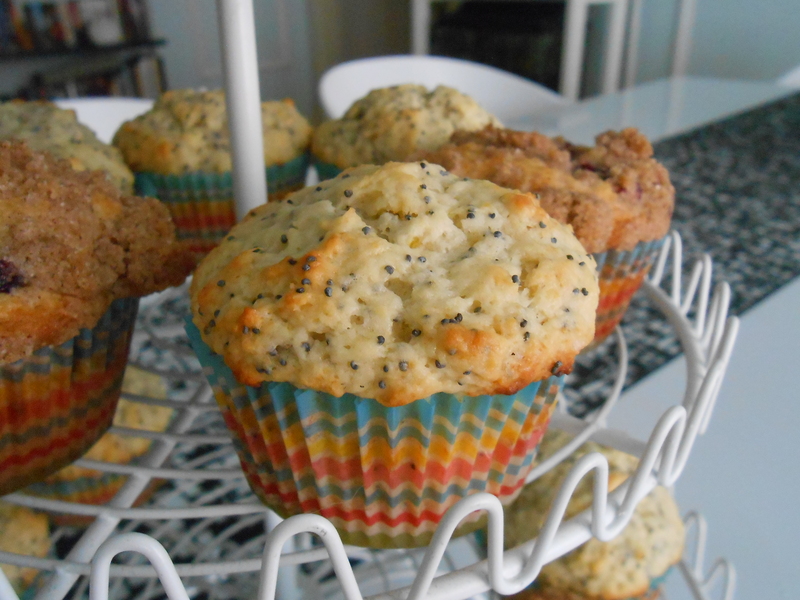 I’ve always loved lemon poppy seed muffins and I think this recipe turned out great (they taste like freaking sunshine!) 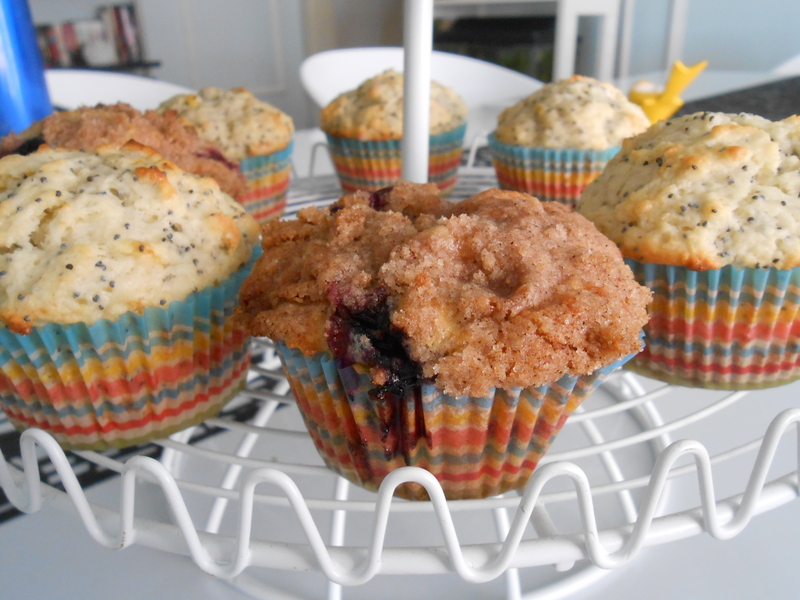 And I’ve posted a pretty good basic blueberry muffin recipe previously, but this new one definitely wins with the crumbly butter/sugar/cinnamon topping and fresh plump blueberries from the farmers market…drooooool. Preheat the oven to 400 degrees and line a muffin tin with 12 muffin cups. In a large bowl, rub the sugar and lemon zest together with your fingertips until the sugar is moist and the fragrance of lemon strong. Whisk in the flour, baking powder, baking soda and salt. In a another bowl, whisk the sour cream, eggs, vanilla, lemon juice and melted butter together until well blended. Pour the liquid ingredients over the dry ingredients and, with a rubber spatula, gently but quickly stir to blend. Don’t over mix. Stir in the poppy seeds. 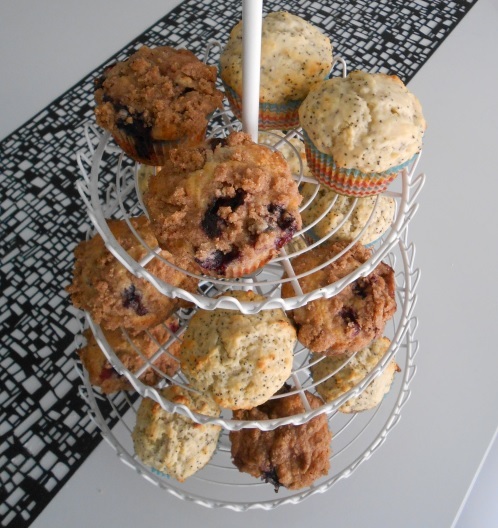 Divide the batter evenly among the muffin cups. Bake for 16-18 minutes, or until the tops are golden and a thin knife inserted into the center of the muffins comes out clean. Transfer the pan to a rack and cool for 5 minutes. Cool the muffins completely on the rack before icing them. 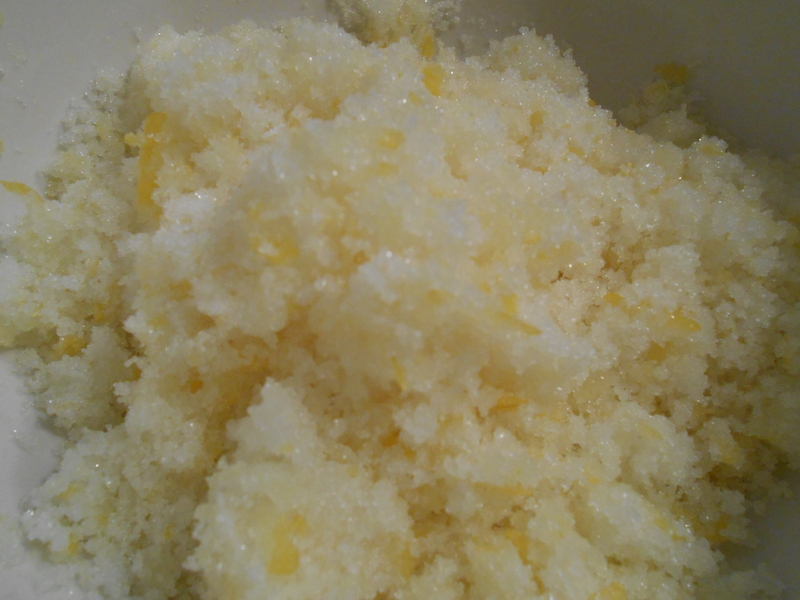 Put the confectioners sugar in a small bowl and add about 1 1/2 tbs of the lemon juice. Stir with a spoon to moisten the sugar, then add enough lemon juice, a dribble at a time, to get an icing that is thin enough to drizzle from the tip of the spoon. 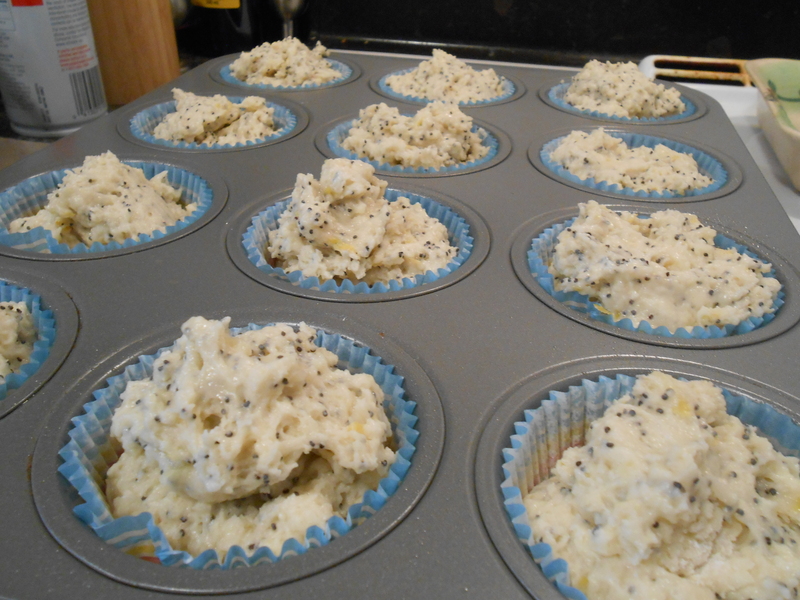 Then drizzle lines of icing over the tops of the muffins or coat the tops entirely. As you can see my pix don’t have the icing – I made it way too watery by adding too much lemon juice so add slowly! Preheat oven to 400 degrees F (200 degrees C). Grease muffin cups or line with muffin liners. Then, combine 1 1/2 cups flour, 3/4 cup sugar, salt and baking powder. Place vegetable oil into a 1 cup measuring cup; add the egg and enough milk to fill the cup. Mix this with flour mixture. Fold in blueberries. 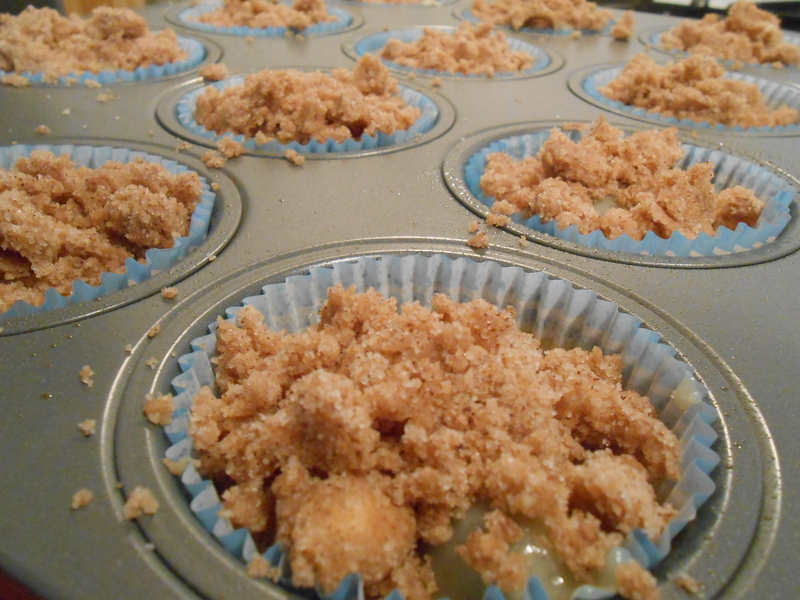 Fill muffin cups right to the top, and sprinkle with crumb topping mixture. To Make Crumb Topping: Mix together 1/2 cup sugar, 1/3 cup flour, 1/4 cup butter, and 1 1/2 teaspoons cinnamon. Mix with fork, and sprinkle over muffins before baking. Then bake for 20 minutes until a toothpick comes out of the center clean.